Like the medieval knight’s body armor, the knight’s helmet also evolved as technology, battle tactics, and the knight’s role in society changed. 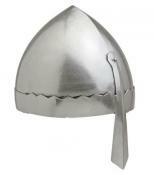 Among the earliest medieval knight helmets are the Norman helmets of the 10th and 11th centuries. The Norman Helmets offered a conical top (usually) and a nasal bar–a piece of metal extending down from the front of the helmet to protect the wearer’s nose. 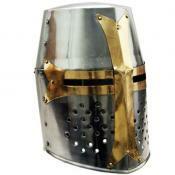 Around the late 12th Century helmets began covering the whole face. Air holes were created to assist the knight’s breathing and eye slits offered a limited, but safer, field of vision. Around this time another “great” helm was developed: the Sugarloaf Helm. The Sugarloaf featured a conical top which could more easily deflect blows. Despite the added protection, the main drawbacks of the great helms (ventilation and visibility) encouraged the development of helmets with liftable visors. 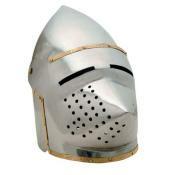 Around the early 14th Century wealthy knights had the option of wearing a helmet with a movable visor. This feature enabled a knight to maintain a relatively full field of vision as well as vastly increased oxygen. Just before battle, a knight could close the visor and receive the full facial protection afforded by great helms. 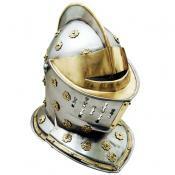 By the late Middle Ages knights’ helmets were a combination of battlefield utility and artwork. Indeed, by the end of the Middle Ages (late 15th-early 16th Centuries) helmets had become ceremonial in appearance–a reflection of the knight’s new role in society. These ceremonial style helmets are often breathtaking in their craftsmanship and artistic features. © 2001–2019 · Knights & Armor · All Rights Reserved.